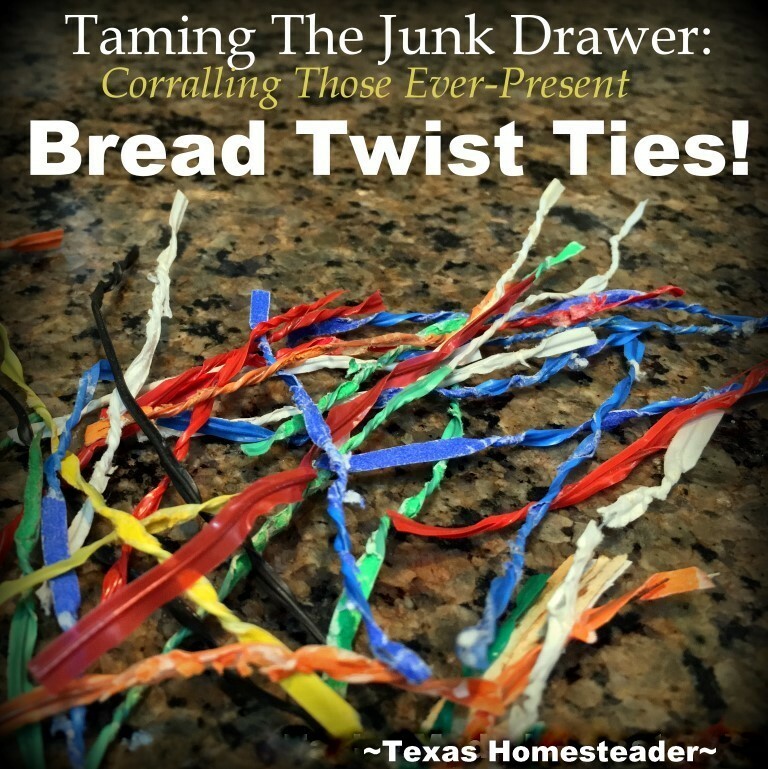 Twist Tie Storage - Tame The Clutter In Your Junk Drawer! 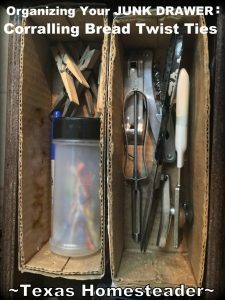 Twist Tie Storage – Tame Your Junk Drawer! I typically bake our bread here on the Homestead. Especially since I’ve finally (FINALLY) found a delicious sandwich bread recipe that’s soft, fluffy and flavorful. But during the summer months we buy our bread instead. You see, RancherMan’s a die-hard bread eater but I hate to fire up the oven during those hot sticky summer months and add heat & humidity to our home. So he & I struck a happy balance – during the more temperate months I’ll bake the bread he craves. But I break from baking & buy his bread during the summer months. I hate all those plastic bread bags we bring home of course. But at least I’ll repurpose them by dividing portion sizes within a freezer bag when I utilize my favored ‘Cook-Once, Eat-Twice’ method of cooking. And of course I’ll reuse more of the bread bags when I resume baking our bread too. I typically bake 3 loaves at a time and section off and freeze most of it. That way I can bring it out fresh for RancherMan’s dining pleasure. But what to do with all those plastic-coated bread ties? I swear they multiply when you’re not looking! I hang onto those bread ties. They’re helpful when I’m storing my homemade bread in those repurposed bread bags for the freezer. But I use them in other many places too. You know, out in the garden or when there are various things I need to tie or bundle up. And RancherMan uses them pretty regularly in the workshop too. So I’ll hang onto them after they’ve served their purpose as a bread tie. But, you know, they’re so small. And they make your junk drawer even more… I dunno, JUNKY! But check this out. Several years ago I held onto this small seasoning container when it was empty. Now I’ll use it to help tame my junk drawer by corralling all those ties. When we need a twist-tie I’ll simply unscrew the top & fetch one. In the meantime they’re all neatly corralled and don’t frustrate me to no end when I’m looking for something else in the drawer. There it is once again, kids. My battle cry: Use Whatcha Got! I have 2 small cardboard boxes that fit side-to-side in this drawer to help organize things too. Now it’s easy to find my bread twist ties as well as my clothespin bag clips, or veggie peeler or can opener. This entry was posted in Blog Posts and tagged Environment, Frugality on October 4, 2017 by Texas Homesteader. ROTFLOL!! !…I do the same thing, as far as saving the twist ties!!! BUT, this is a great idea and will make my life easier….NOW, how about all of those aluminum pie pans that I can’t throw away because they are still good…LOL!! Them twist ties multiply like rabbits as I have a Large peanut butter jar full of twist ties. I do use them to wrap around small extension cords as well as using them on our computer, printer cords to keep them from getting tangled. I have even used them as hangers for hanging Christmas ornaments. Had taught my hubby on colored code ties on buying bread. The standard code is as follows: Days the bread is actually made. Blue: Monday Green: Tuesday Red: Thursday White: Friday Yellow: Saturday To remember the color key just think of the alphabet; the earlier the colors occur in the alphabet, the earlier the bread was baked.